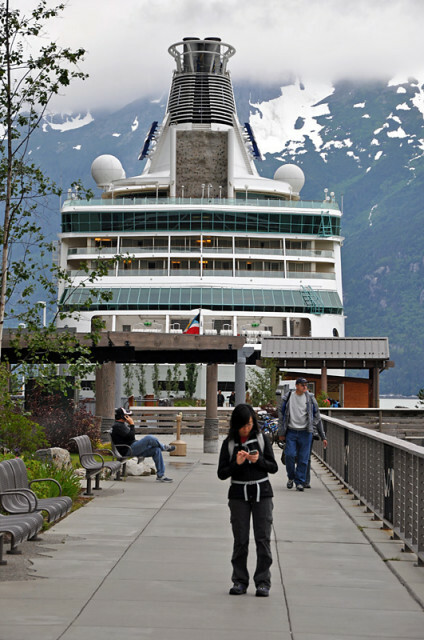 This post about an Alaskan cruise Charlotte and I took in the summer of 2012. Too see all of the pictures from that trip visit the Alaska Gallery. Charlotte and I never thought we’d be cruisers, it’s just a little too easy and cheesy for us. We like the independent style of traveling, going places on our own terms, and experiencing places and cultures the way we want to. With a cruise it’s all done for you. The trip is more about the cruise itself than the places it goes to. On the upside however, it is a good way to visit multiple places in one trip, and in some cases locales that are normally very inaccessible. I guess we always thought taking a cruise might be something worth trying someday, but it wasn’t necessarily high on our travel wishlist. Living in the Pacific Northwest we’ve heard good things about the Alaskan Cruise from various people. It seems like everyone around here has been, or wants to go on this trip. We want to go to Alaska for sure, but just haven’t made it there yet. Enter the family reunion. Charlotte’s Aunt Susan and Uncle Fred, referred to as Tita and Tito in Filipino, are frequent cruisers. 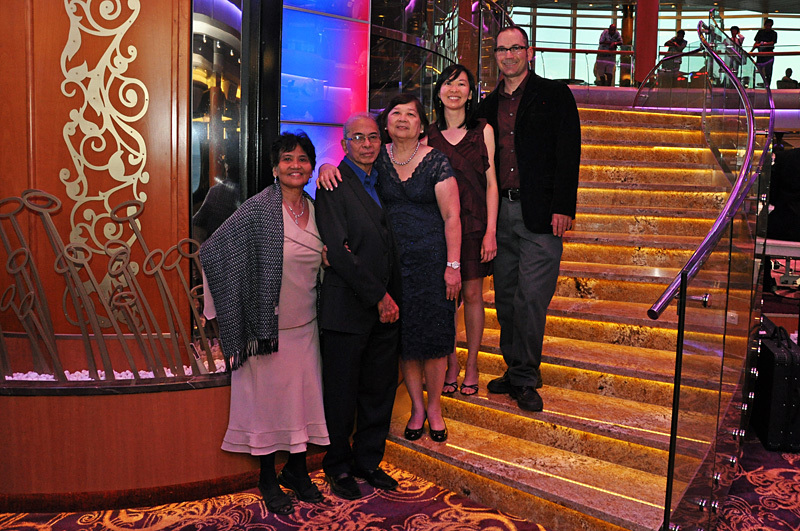 They planned a family reunion aboard an Alaskan Cruise ship and asked us to join. They planned to get all of their brothers and sisters to go along with their two sons Victor and Jerry. Charlotte’s Dad is Tito Fred’s brother, which is where we fit into the reunion picture. Sister Stella also joined us, she is a supercool nun from Saipan, and the sister of Dad and Tito Fred. Tita Susan had two sisters that came along, and some more relatives. I won’t get into all the details, but you get the idea. For this cruise not everyone was able to join since it does get costly with kids. Arranging transportation to Seattle isn’t exactly convenient for most people, except for us since it’s just a 3 hour drive. So only Charlotte’s parents joined us on the cruise, and the rest of Charlotte’s immediate family decided they would come to Portland to spend a week here with us and Charlotte’s parents after the cruise. So in effect it was like a double family reunion for us. The best way to see the Alaskan Inside passage is to take a cruise. 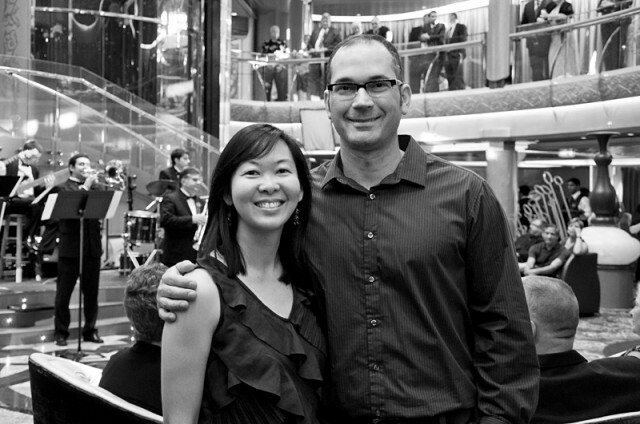 Our cruise was one week. It left Seattle in the late afternoon on Friday and arrived back in Seattle early the next Friday morning. This works perfectly for travelers who need extra time to drive up on Friday and then want to spend the day or weekend in Seattle when they come back. 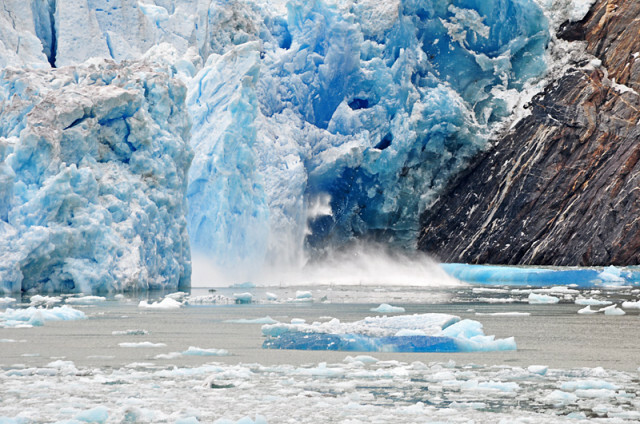 This cruise is unique in that you get to visit some remote spots in Alaska that really aren’t accessible otherwise, and for most of the cruise you are able to see some kind of shoreline on one or both sides of the boat. The scenery is fantastic. Cruising isn’t necessarily cheap, but it is somewhat reasonable if you don’t get carried away with spending on the ship. In fact it can be a really good deal compared to trying to arrange travel to several remote spots. Unfortunately you don’t get to spend a lot of time on shore when taking a cruise, but that’s all part of the deal, they want you to stay on the ship as much as possible so you will spend your money there. Black and White photo of Charlotte and I during the cruise. Getting on the ship was total chaos. Apparently they had a computer network outage so there was a two hour delay. They also held our bags because the white noise machine we packed looked suspicious. We brought it because we just can’t sleep without it. Anyway I was able to explain that away, and once we were onboard then we went through the safety course and were off cruising. One of the first things I noticed about the cruise is there is food, and lots of it. We became very familiar with the Windjammer buffet, which is basically like a hometown buffet. It wasn’t great, but there was so much food that everyone could find something they like at just about any time of the day. Since many people working the ships were from Asia and India there were always some good ethnic selections mixed in, which I appreciated much more than the American standard issue food. 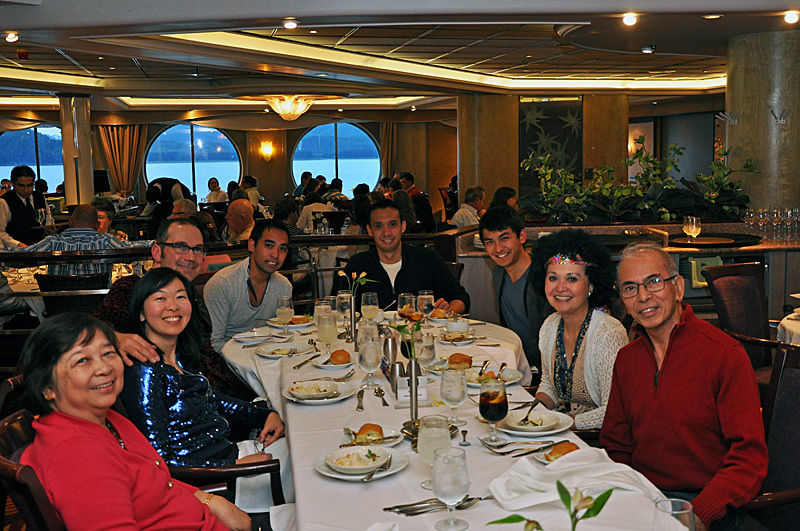 For dinner we all ate as a group in one of the ships restaurants. This was a bit more of a formal affair with appetizer, entree, and dessert served. I have never felt comfortable with or liked formal dining events, but the wait staff turned the dinners into entertainment, and as far as food goes you could order 2 or 3 of everything if you wanted because food was all part of the package and did not cost extra. Alcoholic drinks on the other hand did cost extra and were priced a little higher than you would expect at a typical restaurant- start the tab! Say cheese, and lots of other food too. Everyone says the food on cruises is so outstanding, but we didn’t expect much since our standards are a little different after living in Portland where food and drink are treated like fine organic art. As we suspected most of the food was just ok, although they did have some creative dishes and the nightly Indian dish was great in my opinion, although I think I was the only one the ever ordered it. I steered clear of the “catch of the day” since I didn’t see any trolling lines off the back of the boat, but I did have one stand out dinner which was the rack of lamb with mashed potatoes, mmm. Otherwise I just remember we always had more to eat than we needed, and if you are full then generally you will be happy with your meal. Entertainment was just as readily available as food was. There were nightly events, shows, movies, classes, spas, workout facility, shopping, casinos, starbucks, and just about everything you could possibly want on the ship. Just exploring the ship and all the different features was fun in and of itself. One of our favorite cruise events was the disco inferno theme night where everyone dressed up in 70’s era clothing and danced the night away. The temptations tribute band, and the juggling act were also impressive. I could be wrong about this but I believe that these acts get off at the various ports and then board a different ship so they can actually do several shows in a week as opposed to just one or two shows on the same ship; I’m not sure but it seems logical. Equally fascinating to me was the overall operations of the ship. The captain had a Q&A one night and answered some interesting questions from the audience. It’s really amazing all the training that goes into being a captain and some of the special things they have to do like bring on local navigators in certain areas that require it by law. Those navigators come aboard the ship from another boat that pulls up along the cruise ship while in motion, pretty impressive. One thing that left a negative impression on me was when the captain said the ship gets about 75 feet per gallon of gas! I felt a little disgusted thinking about that along with all the other wastefulness that goes on with a cruise ship. We kind of knew in advance that most everything that goes along with a cruise goes against our principles, but we decided to give it a try anyway. 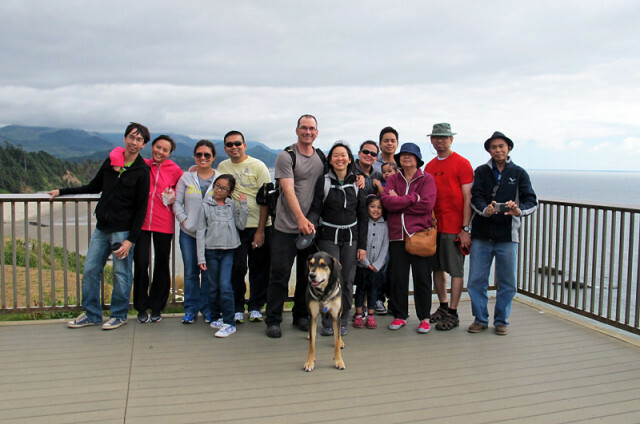 We figured given the circumstances of the family reunion and the unique experience of cruising through the Inside Passage of Alaska it was worth doing, and we had a great time. In the future we might consider something a little more environmentally friendly, intimate, and more adventurous like a Windjammer sailing cruise. For you landlubbers out there, be aware that even though the ship is enormous in size it still rocks side to side quite a bit while cruising, which can be unnerving for some people. I don’t really get motion sickness so I was not bothered by it, but Charlotte had to take Dramamine pills and wear a Dramamine bracelet. Charlotte’s mom got sick, but I think everyone else did ok once we got going. There was quite a bit more rocking of the boat than I expected, most likely the Pacific is rougher than the Atlantic or Caribbean where most cruises occur. Although we had a great time there were a few things we took issue with on the cruise. Wifi access costs about 40 dollars per hour. I had to log in for a few minutes to upload some school assignments and that cost over 10 dollars. I was not happy with this at all since I was taking an online class during this time and would have liked better online access during the trip. It seemed like they could provide wifi at a much more reasonable cost using Satellite internet, or at least give you a data quota limit before charging. There was no phone signal at sea either, your phone will just say “at sea”, but you can get cell service in port since Alaska is part of the U.S. Most people will also have cell service in Canada too, but at international rates. Finally a cell signal and internet! The whole tipping scheme was very confusing too. We found out from one of the Filipino waiters that the crew does not get paid at all, or so he said. They work solely on tips according to him, so if the people opt out of the tips they don’t get paid. They also rotate duties, so on one cruise they might do cooking duties which does not earn tips, and then work a room service position for the next cruise which is a tip earning position. We figured out they do make a lot of money on tips, but considering the rotation and that some people may not tip well or at all, it’s hard to say what the end result is. Whatever the case you will be shocked by the suggested tip amount by the end of the cruise, I think ours was around $200. Since most of the workers are from India or the Philippines the money they do make is worth a lot more to them in their home country so it turns out to be a good deal for them, except for the long and constant hours. The shore excursions are a bit of a touristy scam in some cases too. We took one to the Mendenhall Glacier which cost 120 for two of us. It included a bus ride to the glacier, you stop there for a couple hours then do a self-guided tour, and then bus ride back into town at a designated time. We didn’t know any better so we signed up for this. After getting back in town we discovered we could have just taken a taxi there for 8 dollars and not been so rushed to get back when the bus was leaving. Some things however are better to book through the cruise like the amazingly beautiful White Pass train ride and side trip to the Yukon that we took. 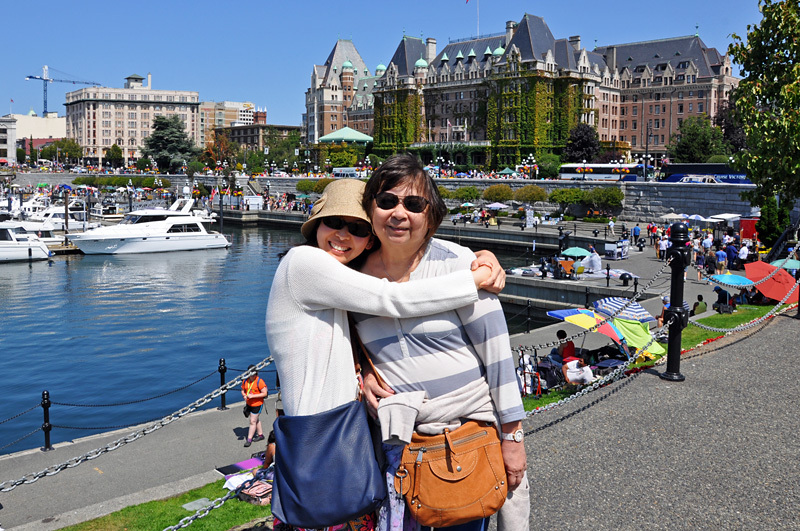 For our last stop in Victoria BC, which we’ve already been to several times, we skipped the cruise shore excursions and took a taxi to Butchart Gardens. This ended up being much cheaper and enjoyable as we were on our own timeframe and came back to explore the town afterwards. For anyone who has never been to Victoria I would just recommend spending all your time exploring the harbor area and maybe do the hop on/hop off bus tour. I do wish we had more time and money to do some of the other Alaskan shore excursions (or book them on our own) like kayaking, whale watching, zip lining, and salmon fishing; but you just can’t do it all with the limited time you get onshore. We did see some whales from the deck of the cruise ship so that worked out nicely. All in all the cruise was a lot of fun. We went to port in Juneau, Skagway, Victoria, and cruised slowly through the inside passage to see the Tracy Fjords. Pretty outstanding! The cruise ship worked great for the family reunion too since we all got to see each other at night and do our own thing at other times. You would frequently bump into the same people during the cruise so it began to feel familiar after a while, unlike when you normally travel overland and never see the same people. I can’t say we truly experienced Alaska culture as we only spent a couple days onshore, but we certainly covered a lot of ground, or should I say water. 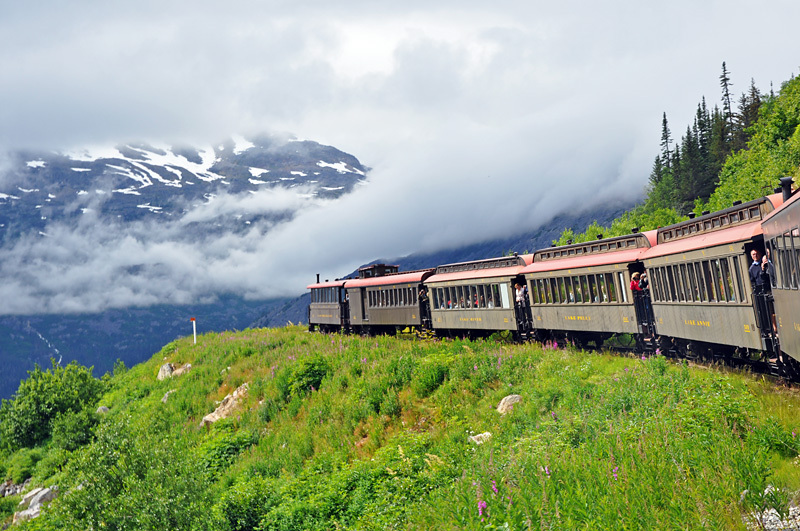 Alaska is such a beautiful and tremendously large place that you would have to make several trips there to really experience it, we hope to go again and see Denali NP and the Kenai Peninsula among other places. The Alaskan cruise is just one way to see Alaska and a great introduction to the last frontier! Next post: Viva Las Vegas!